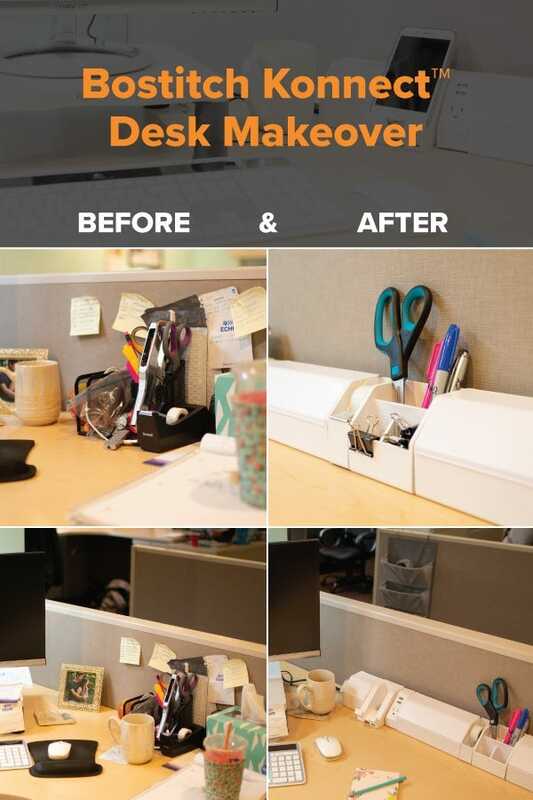 Does your desk need a makeover? Maybe it looks like the one you're about to see, filled with important memos and office must-haves that only resemble clutter. It's vital that any workspace is organized as it allows employees to be more organized and focused, naturally. That's where Bostitch Konnect™ comes in. Why did we develop Konnect™, our new workspace and cable organization system? Simple. Because 31 percent of workers noted that their work area was too small or messy. In fact, they thought cord management was the most important element to keep a workspace tidy. Now, let us introduce you to the beauty of Konnect™ and what it can really do with before and after shots of a real Bostitch employee desktop! You can really notice the difference the organization system provides as all of Rose's small necessities and personal items are tucked away neatly inside the system. In the first photo, it's hard to see what objects were being stored because the area is so packed. However, in the second photo, nothing is poking out and the cell phone is safely displayed to know exactly when someone is calling. Also, notice the difference in tape dispensers. The first is bulky, while the Konnect™ version is more than half the size! Remember how employees said that cord management was the most important element to achieving desktop serenity? Well, the cord management rails sit along the edge of the desktop and mask all existing cables. The computer corner is a problem area for many people. Here, it was sticky notes that engulfed the base. With the sticky note holder located on the far left, there are no more scattered sticky notes. Plus, as an added bonus, it holds business cards and two writing utensils. Pretty cool, huh? Your office needs personal details to provide character and comfort, and as you can see, there is still room for that! Looks like Rose has her desktop under control, from her pens to her mug. Your office is next! What's the harm in cleaning up your 9 to 5, anyway? While you're thinking of a proper answer, browse Konnect™ !